Scratch and Match is a Bonus Challenge in Super Mario World 2: Yoshi's Island and Yoshi's Island: Super Mario Advance 3. It involves scratching cards to get extra lives. 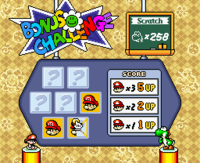 In the game, the player scratches three cards; scratching a Baby Mario panel gives the player extra lives, while scratching a Toady does nothing. The arrangement of the cards is randomized. There are four Toady cards and three Baby Mario cards in the game, leading to a total of seven cards. This minigame returns in Yoshi's Island DS, where players scratch the cards on the Touch Screen using the . This page was last edited on April 15, 2019, at 00:41.